Jadzia evaluates her first Trill initiate and discovers a proto-universe that threatens to annihilate the station. I love Quark yelling, "Female!!" when Jadzia walks away in the middle of a Tongo match. This episode raises a lot more questions about Trills than it answers. For example, how can Jadzia not know why Curzon chose to reject her application when she was just an initiate and how can she not know why Curzon accepted her as the Dax replacement? Doesn't she have all of Curzon's memories? I like the idea that she's trying to set herself apart from Curzon, but she doesn't seem to even be Curzon anymore, which kind of defeats the identity of her entire character as being a joined symbiotic lifeform. This could just as easily have been a story about a daughter trying to set herself apart from her father, and thus it's a step backward--not forward--for Dax's character. So they just dropped off the proto-universe back in the Gamma Quadrant? How does that solve the problem? It is just as likely to expand--eventually encompassing the entire galaxy--or be discovered by some other alien race that doesn't have the ethical scruples of the Federation. Leaving it to be found by, say, the Dominion we've heard so much about, is irresponsible if they truly care about the well-being of the intelligent lifeforms within. The writers painted themselves in a corner and couldn't find a way out, and that's really hard to forgive. The idea of a proto-universe is a neat sci-fi idea, but it's portrayed stupidly here, like it's just another weird anomaly. They can transport it with ease (yes, they can transport an entire universe), it doesn't expand the way a real universe would (assuming the inflationary model), it doesn't seem to have the incredibly high density and mass--and thus gravitational pull--that a universe would have to have, etc., etc., etc. This is an idea that should have been left of the writing room floor. This is probably my least favorite episode of DS9 thus far, because it undoes everything the show has attempted to achieve thus far. 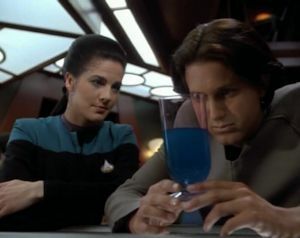 It ignores the aspects of Dax's character that make her unique, and it tries to sell us on the kind of "anomaly of the week" story DS9 has been avoiding, topped off with a resolution that makes absolutely no sense. It's a very weak story that is very poorly executed, and I'd rather not spend any more time discussing it.